This Tuesday is Mardi Gras and holidays have been a Really Big Deal in our house since Elia caught the holiday bug this past Halloween. I’m from New Orleans and I get a little nostalgic for home at this time of year, so sharing stories and traditions is fun for both of us. Today we made some Mardi Gras masks and dyed pasta beads to get into the spirit. The base is simple: a white paper plate cut in half. But then the fun begins. Mardi Gras is about excess so this isn’t the time to practice restraint or minimalism. In other words, it’s perfect for a toddler or preschooler! Gather up paint or markers, glitter, sequins, feathers, beads, etc. If it can be painted or glued on, break it out for this craft – especially if it glitters and shimmers. 2. Paint it or color it with markers. The official Mardi Gras colors are purple, green, and gold, so that’s what we went with. 3. 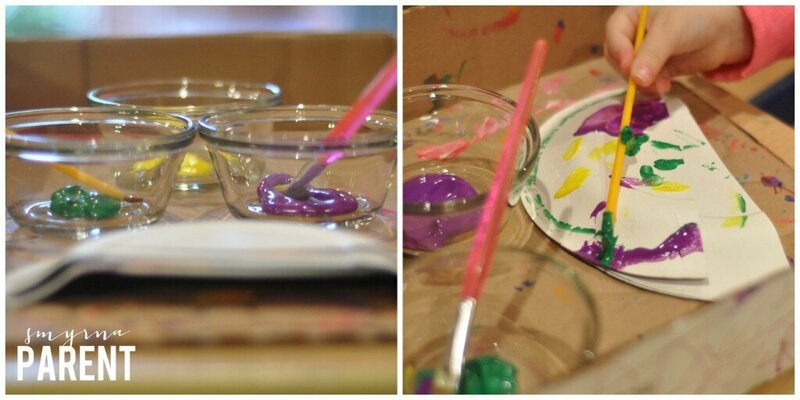 We sprinkled glitter on some masks while the paint was still wet. On others, we let the paint dry and then we painted designs using a glue and water mixture and my daughter poured the glitter on the mask. 4. Add any and all of your extras: sequins, beads, feathers, etc. Elmer’s Glue wasn’t cutting it for the beads, so I used a hot glue gun. 5. Cut out the eye holes. I just drew them on the unpainted side of the plate and cut them out. You can very much tell it was done freehand but glitter, beads, sequins, and feathers will distract from that! 6. Glue a craft/popsicle stick onto the unpainted side. 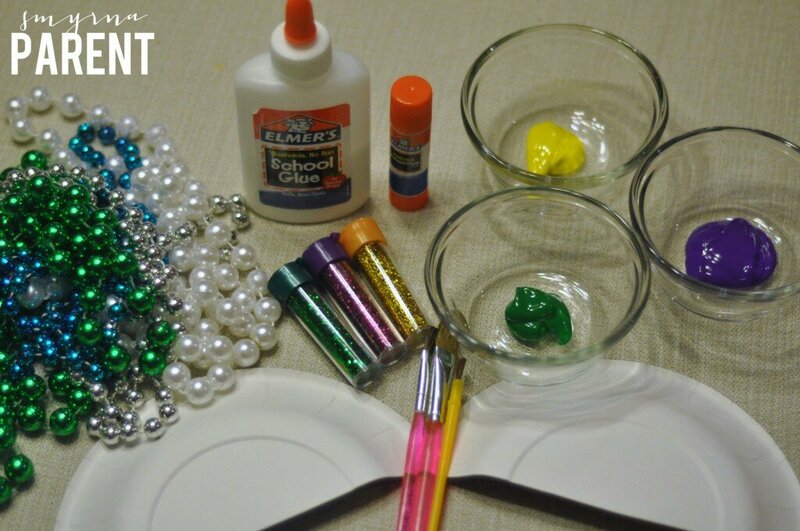 If you are simply using paint and glitter, regular glue will work. If you have heavier items like beads, you should use hot glue to make sure the craft stick holds. Let them dry & you have your masks! 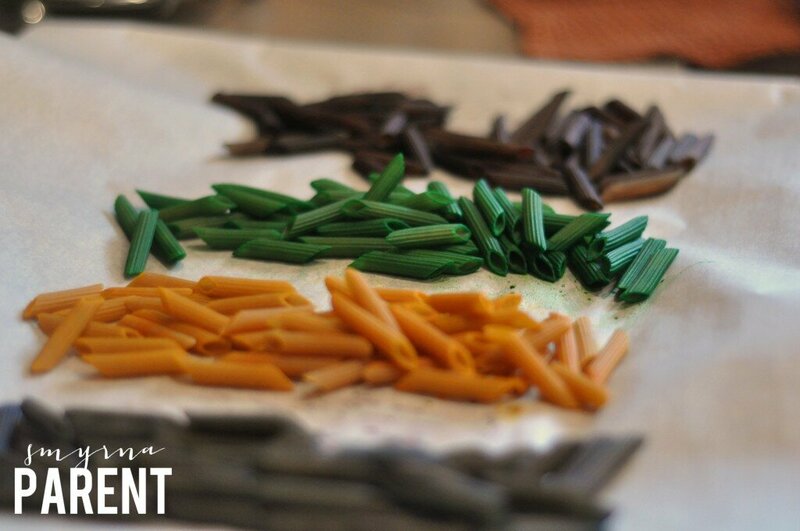 Dyed pasta is so quick and simple, which is perfect since no Mardi Gras outfit is complete without beads. Not to mention the classic fine motor skill work involved in threading the pasta. 1. Gather your pasta, rubbing alcohol, food coloring, yarn or shoe laces, and ziplock bags. I unfortunately only had whole wheat pasta on hand, so the colors aren’t as vibrant as I wanted, but I’m coming around to the earthier look. 2. Add 1/3 cup pasta, 1 tsp rubbing alcohol, and 2-3 drops of food coloring to a ziplock bag. Gently mash and squish the dried pasta in the plastic bag until they’re uniformly dyed. My daughter loves helping with this part, and of course there’s a learning opportunity in watching the red and blue mix to create purple. 3. Let the pasta dry on a cookie sheet covered in parchment paper. The rubbing alcohol helps it dry quickly. 4. Use your yarn or shoe laces to string the pasta. 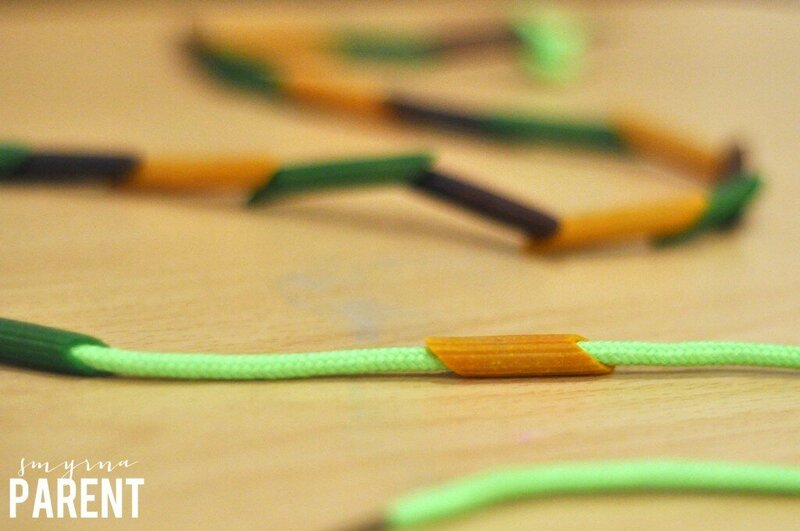 We used shoe laces since the plastic tip makes threading easier. * There are no cute photos of the child actually creating these crafts, because she decided that she needed to be naked today. All day. Maybe she understands Mardi Gras more than I thought. 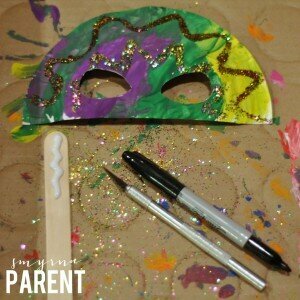 You can find more Mardi Gras crafts and activities on our Smyrna Parent Pinterest board. 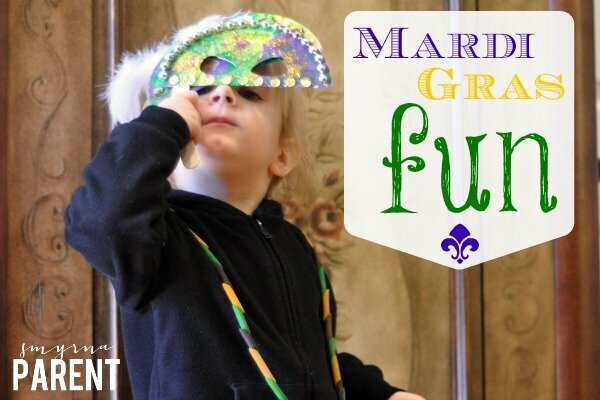 Want to teach your little one more about Mardi Gras? 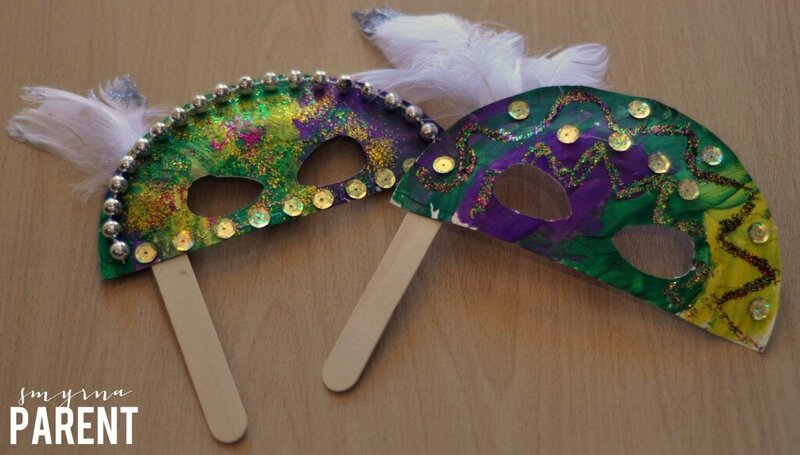 There are several great books available at the Smyrna and Cobb Libraries to bring a little Mardi Gras into your home. Recommended ages 4-8. 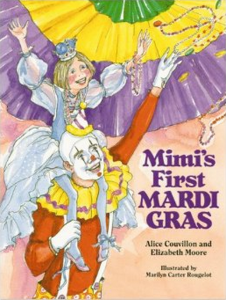 This book provides a VERY comprehensive review of Mardi Gras festivities and traditions. However, it is almost too much information and can feel forced in places. From well known traditions like King Cake and the Rex parade, to the lesser known Boeuf Gras, Mardi Gras Indians, and religious history, this book covers it all. Of the 4 books reviewed here, my daughter (almost 3) liked this one the best! Another book packed with Mardi Gras facts. In this one, our “heroine” is Jenny Giraffe who was able to secure a spot in the Orpheus Parade after some riders are no longer able to participate. Being a giraffe and unfamiliar with Mardi Gras, she has a ton of questions, which are answered by her human friends. Again, the narrative flow is occasionally interrupted by too many facts. There’s also a strange subplot concerning Jenny’s mother: Jenny hasn’t seen her in a while and doesn’t seem to know where she is. When she learns she’ll get to ride in the parade, Jenny’s human friends get her mother out of the zoo so they can ride together. After the parade, mom returns to the zoo with Jenny promising to visit her often while Jenny gets to continue living with her human friends. Huh? I keep getting so distracted by this odd subplot that I miss some of the other Mardi Gras details. This book is recommended for kids from kindergarten to 3rd grade. 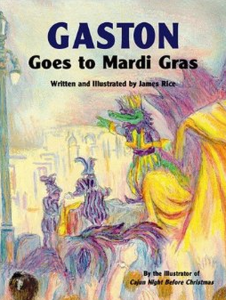 Another Mardi Gras book, another anthropomorphized character leading us through the festivities. This time, it is Gaston the alligator. This one is my personal favorite – I love the illustrations and I like that it covers some Cajun culture and traditions as well as the big Mardi Gras activities. 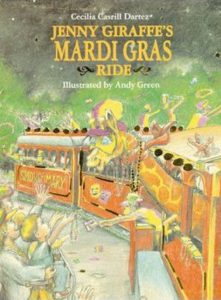 This book provides a different look at Mardi Gras day than the others do. It follows two African American children through a street party, then a wonderful description of the Mardi Gras Indians and the Zulu parade, followed by more neighborhood fun and food. 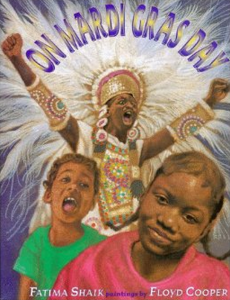 Unlike the other books, there is very little historical or background information given and the Mardi Gras Indians, community, and street parties take center stage over the traditional parades, beads, and king cake. Generally speaking, it is written for those familiar with Mardi Gras and isn’t the big introduction or overview that the others are. The back page does provide more background information and descriptions, and while it’s not a part of the story it does help explain things. Lol! Love the reason for not having any pics of Elia making the crafts. Thanks for the ideas. Definitely need to dye some beads! Ha! I took the pictures anyway, thinking I could crop creatively, but that definitely didn’t work! Great ideas, thanks! My daughter is determined to have a Mardi Gras party, and her birthday was on Fat Tuesday this year! So glad you enjoyed it! Happy belated birthday to your daughter!